Wasn’t that a great article Marc did on sumps last month? He sometimes goes a bit overboard when it comes to sumps but most people don’t have a ¼ scale model of the Titanic as Marc has in his. I do want to mention something Marc brought up that really caught my attention. For years I have been telling people you need at least 10 to 20 times volume changes per hour in your tank. The way to do that was to use a return pump with high enough output to accomplish that feat. The net effect is that water surges through the sump at perhaps 100 – 200 times sump volumes per hour if your sump is 10% of the tank’s volume. Talk about a tsunami! Marc suggests lowering the return pump rate to only 5 times or lower. He then says you can get the needed circulation rate by using a closed-loop system or some powerheads to increase turnover into the 10-20 times range. That makes a lot of sense to me as it allows equipment in the sump to perform better, decreases noise and lessens microbubble formation. On Reef Central, there is a head loss calculator that lets you define your sump’s plumbing and size a pump to meet your needs. It is a handy tool, and I suggest you use it. It can also be used to determine flow in a closed-loop system; just remember to discount the vertical distance of a submerged pump's discharge as it doesn’t add lift head, only friction loss. I’ll discuss designing a closed-loop system in a future article. If you do have a sump all plumbed and the tank properly located, it is time for a very, very important step--a tap water test of the entire system. Even the most careful do-it-yourselfer's system can have a leak, and it is best if the leak is merely plain tap water and not seawater. Salt costs money and getting it out of your carpeting costs even more. Before filling it up, make sure that the tank is as close to perfectly level as possible. After leveling the system is achieved, fill the tank to operating levels, keeping a close eye out for leaks as you do. Once full, start the return pump, and again, check for leaks. Check on it often for an hour or two and, if everything is okay, let it run overnight. A dry floor in the morning means you did a good job. Check the level as a large tank full of water may find weak areas in the floor and begin to sag. The best way to check the level now is to use the water in the tank as the level. Measure at each corner and see if there is a difference in water levels. If so, you are going to need to shim the tank, but not while it is full! Besides hurting yourself, you may break the tank if you try to push shims under a full tank. Mark down the readings you took of the corner measurements and make some shims to make things level. Place them under the stand when the tank is empty. Some people don’t make a big deal about having everything absolutely level, but I like to get it as close as possible because a non-level tank has irregular flow over the weirs (the overflows) to the sump. Better flow results when the weirs are level. If you are not going to be adding anything to the tank for some time, it is fine to leave the water in it. Yeah, if your water has phosphates added as a corrosion inhibitor some may stick to the glass but the amount is very small and is not going to cause a problem when you switch it out with saltwater. I prefer to use reverse osmosis de-ionized (RO/DI) water in a new tank one final time before I start the changeover to saltwater. If you have the time, and a RO/DI that has the necessary output, it gives a final cleaning with pure water. Okay, okay, I see that look in your newbie eyes. Bring on the salt you say! That’s fine, if you wish. Saltwater doesn’t go bad, so adding it after you have a leak-free, level system is fine. Now, there are all sorts of synthetic salts on the market and some of you may live in an area where you can get clean ocean water. Paul B, a frequent contributor to the New to the Hobby Forum on Reef Central, gets his water from Long Island Sound and has been doing so for years. Unlike the hives and skin rash, which Paul suffers continually from swimming in the sound, his fish and invertebrates do fine. For the rest of us, we are going to need synthetic ocean water (the EPA calls it SOW, but in the hobby it is referred to as artificial seawater or ASW). Some salt mixes have been around for years and have a pretty loyal following. Instant Ocean is probably the most well-known and is still the most popular brand. I rarely mention products in my columns because with so many choices, it is hard to try them all. Instant Ocean is a fixture but most tests show it is somewhat low in calcium and magnesium. In a fish-only tank that makes little difference but if you plan on having small polyp stony corals, you will need to add calcium. No matter what mix is chosen, you will be dosing calcium anyway so the slightly lower calcium level is only a minor problem. There are many polls on Reef Central about which salt is best so you can see how the brands compare. There are also some heated arguments over published salt mix studies and, as Randy Holmes-Farley said in a recent thread, "the salt mix manufacturers can change the formula in the blink of an eye." Choose one that you like and hope that you can find some bargains if you have a large tank. In general, about ½ cup of artificial saltwater mix is needed for a gallon. This is only general, however, as the amount of hydrated water in each mix varies. With some brands it may even vary between batches. Our goal is to produce a salt solution with a specific gravity of 1.025-1.026. Specific what? Time for a little science here. That pure RO/DI water you have has a weight of 8.34 pounds per gallon. Specific gravity is a measure of density, and it so happens for liquids that freshwater is the standard with a specific gravity of 1.000. Ocean water has about 3.5% of various salts in it and that increases its density to about 8.557 lbs. per gallon. If we divide 8.557 by 8.34 we get 1.026, which is the specific gravity of ocean water. Having to weigh out 100 gallons of water is hard on the back so we can use a tool to find the correct specific gravity. One tool for this purpose is called a hydrometer. It is a weighted float that sits in the water and has a scale enclosed. The water level rises to a point on the scale that equals its specific gravity. Some of these also use a swing arm, but they are more subject to error than a float type. For even greater accuracy there is a device called a refractometer. As light passes though a liquid, its speed changes in relation to the liquid’s density. By measuring this change, the water's density can be measured. If you can afford it, a refractometer is the most accurate way to go. Make sure to purchase one that has built-in automatic temperature compensation (ATC). I could go on here, but I’ll let Marc tell you more in this article: How to Change Water in Your Reef Aquarium. Marc, unlike yours truly, uses lots of pictures and his advice, whether filling a new tank or doing a routine water change, is a sound method to accomplish this task. Marc mentions heating the water before adding it to the aquarium. However, at this point in time there is no need to do that in the makeup container. Yet, you do plan on a tropical reef tank and that means it will need to be warmer than room temperature. The average temperature of the world's tropical reefs is a shade under 82°F. This varies considerably, especially as one moves further from the equator. Yet, very few tropical reef environments exist where temperatures fall below 76° F. The reef areas around Florida have the Gulf Stream to thank for its warm water flow from the south. We will need heaters to raise the temperature in our tanks. I said heaters, plural, as putting all one's hopes on a single heater is a poor choice in an expensive reef tank. I always like to have three or more. One heater in the tank, another in the sump, and a third as a backup usually works. I set the sump and one tank heater to 80° F, and the backup to about 78° F. For a 100-gallon tank I like to use a 150-watt heater for the tank and 250-300 watts in the sump. The sump gets the higher wattage as it has a higher flow rate and loses heat faster than the main tank. I also place the backup heater in the sump. In general, the larger the tank, the less wattage is required. A small tank will take anywhere from 5-7 watts per gallon to heat. A large tank, over 100 gallons, may take three watts or less. That is because the large tank has a large thermal mass and holds heat better than a small tank. True, it takes longer to heat, but you hopefully only do that once. A few watts saved here and there will slightly cushion that first reef tank's electric bill. In this day and age most reefkeepers go with fully submersible, titanium heaters. Sure, cheaper glass or "unbreakable" plastic coated heaters are available but drop a large chunk of live rock on that heater and you can test that "unbreakable" claim quite easily. A broken heater is not only a shock hazard but the copper internal components will leach copper into the tank when in contact with saltwater - not a good event for any reef tank. Titanium is far safer, so save those glass heaters for heating your top-off or water change water. A fully submersible heater makes sense because it is easy to hide, but it has another advantage. Warm water rises, so if the heater is on the bottom, it is at the coldest point in the tank and the heated water provides circulation. Yes, you have a ton of mechanical circulation in a reef tank, but usually when you play “hide the heater,” you place it in an area where circulation rates may be low. The upward thermal circulation takes care of that problem. Whatever you do, don’t bury a heater in the substrate. Circulation there is terrible, and it is very likely the heater will overheat and fail. This is especially true of the high-end temperature-controlled heaters where the thermostat is located remotely from the heating element. When choosing that type of heater, make sure the heating element has a safety thermocouple to prevent overheating if circulation is blocked. Even growth of coralline algae can cause a heater to overheat. Clean it often, and when removing it from the tank, always unplug it at least 15 minutes prior to removing it from the water. These modern heaters can be very accurate with some claiming to control temperatures to less than half a degree. Still, you want a reliable tank thermometer to keep a visual check on things. I like the old fashion hang-on-the-tank wall thermometers but some people spring for a digital model, which is overkill in my book. Do avoid those stick-on-the-outside, liquid crystal strip thermometers. They are very inaccurate. If you have pure water, good lighting, strong circulation and accurate temperature control, all you need is some live rock and you can set up your initial tank. Oh, there are a few other items you’ll need but at this point you have the essential mechanical parts of a marine aquarium. Next month I will be talking about live rock and sand and also other filtration mechanisms. This month I will talk about the two mechanical filters that one should strongly consider---the first is the protein skimmer. While not truly a filter, it is a great way to remove unwanted organic and some inorganic materials from the water. While not cheap, it is worth its price when it comes to helping your biofiltration keep the water pure. A skimmer works on the principle that some pollutants in the water are just as happy to expose themselves to air as they are to attach to a water molecule. 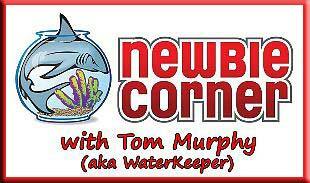 Hey, I hear that laughter coming from the Reef Chemistry Forum but this is the Newbie Corner. Darn! You can see this effect on a calm aquarium. That film on the surface is composed of organic materials such as proteins, house dust, and anything else that settles on the water. Proteins have a molecule where one end is attracted to water (called hydrophilic) and the other end is repelled by water (hydrophobic). The net result is they congregate at the air-water boundary of the tank. All proteins contain nitrogen and contribute ammonia when they break down in the tank. Removing them at this stage lessens the overall biological load on the tank. Now one could float paper towels on the tank and remove the film, but it would quickly return. Enter the skimmer that removes them constantly. If you beat some egg whites, a form of protein, they form into foam as the entrapped air attaches to the proteins and forms bubbles. This is what a skimmer does. It adds bubbles into the water column that attach to protein and other organic molecules and pulls them to the surface. There, some sort of bubble trap collects the produced foam so that it may be removed from the tank. As an added benefit, many metals attach themselves to organic molecules, and they too are collected in the foam. One drawback is that magnesium and calcium may also attach to these same organic molecules. Usually, regular water changes are enough to replace these losses. We want fine bubbles in our skimmer. Thousands of small bubbles provide far more surface area than hundreds of large bubbles and therefore provide more area for molecules to attach. However, they can’t be too fine or they will become almost neutral in buoyancy and take forever to rise to the surface. Simultaneously, we do want some contact time, because the bubbles need to collect as much organic material as they can as they rise through the water column. In early skimmer models, taller was better. A tall skimmer increased contact time and, therefore, organic collection. This more or less got out of hand and some skimmers were 10 feet or taller, and rather hard to hide. Today, there are all sorts of ways to make a skimmer more compact while maintaining contact time. Often, the water and air move opposite of each other, counter-current, and the air spirals in the skimmer's body to make it travel a longer path. Many good skimmers can be placed within a modest aquarium stand. You don’t need to spend a fortune on one either. A skimmer costing close to $1000 may not be much better than on that costs a quarter to a third of that amount. Do you have a small tank without a sump? There are hang-on-the-back models that do a pretty decent job. Some aquarists have tanks without skimmers, but if you can afford one, it is well worth the money. There are several articles in past issues of Reefkeeping Magazine, e.g., Skimming Basics 101 and What is Skimming? that will provide much more information about skimmers. Also, check the Reef Central DIY Forum for information about how to build your own. Going back to Marc’s sump article, you may have noticed that he has no problem with urban clutter. He had a half dozen or more items in his sump. One that he mentions (but does not use) is a UV sterilizing filter. Short wave, ultra-violet light can give you a nasty sunburn and one that is fatal to microorganisms. It can nearly sterilize water. Two things influence how well one works in an aquarium: the UV radiant energy output of the lamps and the exposure time. If you have a high flow return to the tank, you need some powerful lamps and a fairly long path in which the water flows. Do you need one? Not in my opinion. For the normal home aquarium, if a disease is introduced into the tank, all the occupants will be infected before the UV can eliminate it. Where they do come in handy is if you have multiple aquariums fed by a large common sump. Here a UV on the return line can prevent a disease from moving from one tank to the next. They are also nice for a hospital or quarantine tank because flow rates are lower and these tanks are smaller, so you don’t need a real powerful unit to treat the water. If I had a choice of getting better lights or a UV sterilizer, the lights would win out every time. Another big buck item he mentions is an ozone generator. Ozone in the water does two things. Like UV, it will kill microorganisms, but more importantly, it breaks down complex organics so they are more easily removed from the tank. A drawback is you don’t just need the ozone generator to change oxygen (O2) to ozone (O3) but also a way to control the ozone generator’s output. If not, levels can become lethal to the tank’s inhabitants. We do this with a device known as a redox controller. Put simply, ozone lowers the oxidation-reduction level in the tank while dissolved organic matter increases it. The controller allows the ozone to reduce organics, but only to the point where the ozone is still non-toxic. Ozone, when combined with activated carbon, can produce crystal clear water with low dissolved organics. However, considering the cost of the technology, only a reefkeeper with deep pockets should consider one at this point in time. Randy Holmes-Farley has a three-part series on ozone - Ozone 1, Ozone 2 and Ozone 3 that details using ozone in the reef aquarium. I mentioned activated carbon in the above paragraph and now we are on to something. Activated carbon is just carbon that is treated under high pressure with superheated steam. It is somewhat like Quaker Puffed Rice™ in that it puffs up and in doing so has an amazing pore structure. A single gram may have thousands of square feet1 of surface area and that large surface area is a magnet for organic materials. Things that bacteria won’t eat, or that a skimmer won’t remove, attach to the carbon and can be removed from the tank. One of the great things about carbon is that it is cheap. You do want to choose one that is low phosphorus, low ash. The low ash content is sometimes overlooked, but a high ash carbon will play havoc with the tank’s pH. Aquarium grade carbons are usually acid washed (hopefully, with acids other than phosphoric) and that removes both phosphates and pot ash. One can just place some carbon in a filter sock and hang it in the sump, but that is not a very effective use of the material. Enter the second filter I want you to consider—the lowly canister filter. This little power house has a world of uses and even a good one can cost less than $75. These are a real bargain, in my opinion. Load it up with activated carbon, hang it on the sump and let it remove those nasty organic molecules at a bargain basement cost. Have phosphates? Place a phosphate sponge, granular ferric oxide (GFO), in the canister and you can remove phosphate too. You can even run GFO and carbon at the same time but don’t mix the media. Carbon only lasts about two weeks at best, while the GFO can last over two months. Place each in its own holder so you can change out the carbon without throwing out the more expensive GFO. We are not done yet. Stir up a sand storm or have a bacteria outbreak in your tank that creates cloudy water? Place a micron filter in the canister, and it will clear it up in a matter of hours. In fact, a micron filter will also remove disease-causing organisms, and do it faster than a UV sterilizer can. Overall, the humble canister filter gets a big "thumbs-up" for a welcome addition to a new reef tank. Most of the other stuff Marc mentions are really convenience items. Automatic top-off systems do maintain constant water levels, but a plastic bucket used for daily top-off will avoid the sump going dry. If you wish, you can also build your own at fairly low cost. A kalkwasser (lime water) reactor will increase pH, add alkalinity, and replenish calcium in any tank. You can also get a Rubbermaid™ trash can, put some top-off water in it, add some powdered pickling lime and stir it up. After it settles, you have good quality kalkwasser, and it hardly costs anything to make. A calcium reactor replaces lost calcium without adding much in the way of additional pH or alkalinity. Yet, you can buy calcium supplements at the local pet shop that do the same thing without the cost. Besides that, a brand new tank is not going to have much of a calcium demand at this point anyway. Simple water changes should keep things in balance. We will talk about many of these things in the future, but unless you are a lottery winner, many are not needed to get that new tank going. Let’s see, we have a tank full of high quality saltwater, a RO/DI system, decent lighting, fine circulation, perhaps a sump and maybe a few of those extra items I mentioned above. I think it is time to put something in that tank. NO!!! Forget the damsel! Next month, we ROCK! 1 According to Wikipedia -"A gram of activated carbon can have a surface area in excess of 500 m², with 1500 m² being readily achievable. For comparison, a tennis court is about 260 m²" at just 500m² it would have 5382 ft².